Nephrotic syndrome is characterized by massive proteinuria and injury of specialized glomerular epithelial cells called podocytes. Studies have shown that, whereas low-concentration thrombin may be cytoprotective, higher thrombin concentrations may contribute to podocyte injury. We and others have demonstrated that ex vivo plasma thrombin generation is enhanced during nephrosis, suggesting that thrombin may contribute to nephrotic progression. Moreover, nonspecific thrombin inhibition has been shown to decrease proteinuria in nephrotic animal models. We thus hypothesized that thrombin contributes to podocyte injury in a protease-activated receptor-specific manner during nephrosis. Here, we show that specific inhibition of thrombin with hirudin reduced proteinuria in two rat nephrosis models, and thrombin colocalized with a podocyte-specific marker in rat glomeruli. Furthermore, flow cytometry immunophenotyping revealed that rat podocytes express the protease-activated receptor family of coagulation receptors in vivo. High-concentration thrombin directly injured conditionally immortalized human and rat podocytes. Using receptor-blocking antibodies and activation peptides, we determined that thrombin-mediated injury depended upon interactions between protease-activated receptor 3 and protease-activated receptor 4 in human podocytes, and between protease-activated receptor 1 and protease-activated receptor 4 in rat podocytes. Proximity ligation and coimmunoprecipitation assays confirmed thrombin-dependent interactions between human protease-activated receptor 3 and protease-activated receptor 4, and between rat protease-activated receptor 1 and protease-activated receptor 4 in cultured podocytes. Collectively, these data implicate thrombinuria as a contributor to podocyte injury during nephrosis, and suggest that thrombin and/or podocyte-expressed thrombin receptors may be novel therapeutic targets for nephrotic syndrome. Nephrotic syndrome (NS) is the third leading cause of ESRD, which is the eighth leading cause of death in the United States.1,2 NS is characterized by massive proteinuria and persistent proteinuria is associated with progression to ESRD.3–7 Currently, NS therapies are limited to immunosuppressive agents, which may be associated with clinically significant side effects and/or treatment resistance.8,9 Proteinuria results primarily from podocyte damage and loss, although other glomerular defects may contribute.10,11 NS-associated proteinuria induces coagulation protein imbalance, resulting in a complex coagulopathy notable for enhanced thrombin generation.3,12–14 Nonspecific thrombin inhibition, with heparin or antithrombin (AT), is known to attenuate proteinuria in the doxorubicin and puromycin aminonucleoside (PAN) models of NS.15–18 Thrombin demonstrates opposing, concentration-dependent effects on endothelial cells, wherein low concentrations mediate cytoprotection and higher concentrations activate a proinflammatory phenotype.19 A similar effect has recently been noted in glucose-challenged podocytes, wherein 50 pM thrombin is cytoprotective and 20 nM thrombin exacerbates glucose-mediated cytotoxicity.20 However, the receptors involved in thrombin-dependent podocyte injury, which may represent novel therapeutic targets for NS, are not yet known. During NS plasma proteins, predominantly albumin (66 kDa) but also coagulation proteins of similar molecular mass, are inappropriately excreted in the plasma ultrafiltrate.3,5,6,13,21 Coagulant enzymatic activity may proceed in the ultrafiltrate, which has a pH and calcium concentration similar to plasma.22–28 Moreover, podocytes express tissue factor, a potent coagulation initiator, perhaps in a stress-induced manner.29–31 Thus, during NS podocytes may be exposed to coagulation factors, including prothrombin (69 kDa), which may be converted to thrombin (37.4 kDa).3,32 Recent studies have demonstrated that the protease-activated receptor (PAR) family of G protein-coupled receptors (GPCRs) is expressed by podocytes.20,33–35 PARs are specialized GPCRs that become activated after N-terminal cleavage by coagulation enzymes and other proteases, which exposes a tethered ligand.36,37 Importantly, these receptors appear to be relevant to glomerular diseases.20,33–35 We hypothesized that thrombin contributes to podocyte injury in a PAR-specific manner during NS. To test this hypothesis, we performed experiments to determine (1) if hirudin, a highly specific thrombin inhibitor, recapitulates the antiproteinuric effects of AT; (2) if thrombin interacts with podocytes in situ; and (3) which PARs are involved in thrombin-mediated podocyte injury. Thrombin inhibition reduces proteinuria in the PAN-induced and hDTR rat models of NS. (A) Rats were given 50 mg/kg PAN (intravenous) on day 0, both twice daily subcutaneous hirudin (1 mg/kg; n=8) and daily intravenous AT (500 IU/kg; n=7) reduced day 10 mean±SEM urine protein-to-creatinine ratio versus control animals (n=8), which received sham treatment with the carrier solution (normal saline) by both routes at the respective frequencies. (B) Rats were given 25 ng/kg DT (intraperitoneal) on day 0. Twice daily hirudin (1 mg/kg; n=5) reduced day 10 mean±SEM urine protein-to-creatinine ratio versus control animals (n=4) receiving sham treatment. *P<0.05 versus day 0; #P<0.05 versus control. Plasma levels of prothrombin fragment 1.2 (F1.2), an in vivo marker of thrombin generation, and thrombin-antithrombin (TAT) complex, a product of thrombin regulation, remain stable in the presence of increasing proteinuria severity whereas urinary levels increase significantly, consistent with urinary thrombin activity (F1.2: R2=0.62, P<0.001 and TAT: R2=0.77, P<0.001; Supplemental Figure 1). 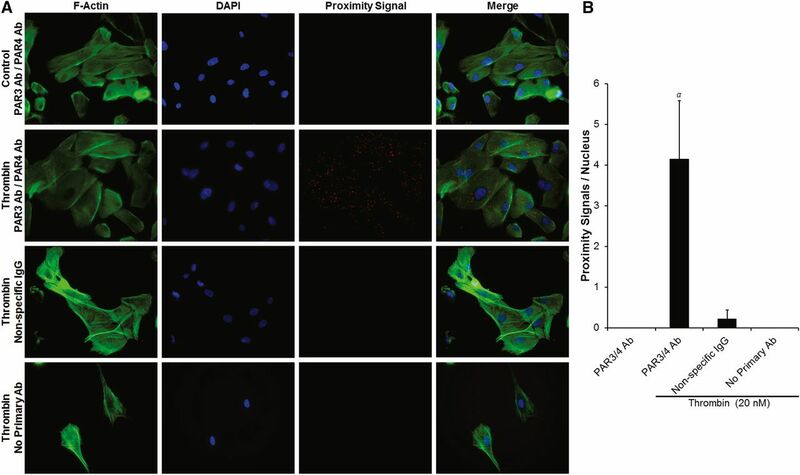 Thus, immunofluorescence colocalization was utilized to determine the pattern of thrombin-podocyte interactions during the course of proteinuria development (Figure 2). 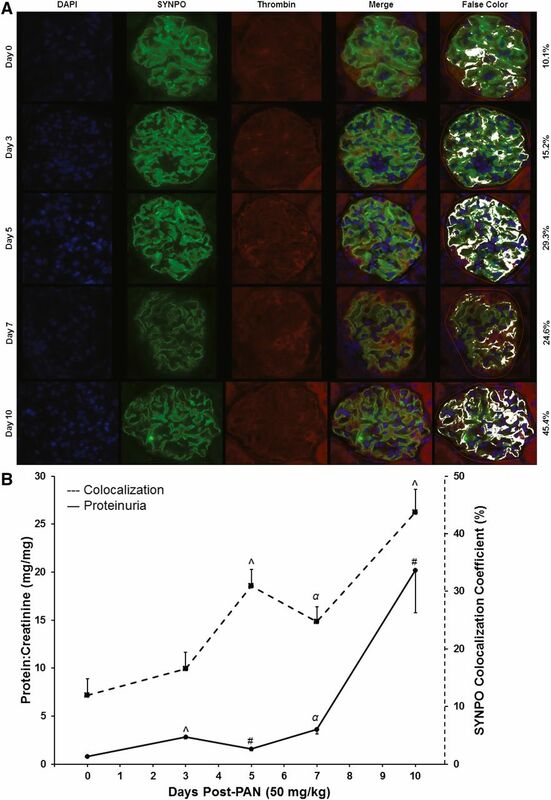 These experiments demonstrate that thrombin colocalization to podocytes increases during the course of proteinuria development in PAN-nephrotic rats (P<0.001); roughly in parallel to increasing proteinuria severity. Thrombin colocalizes to podocytes during PAN-induced rat nephrosis. (A) Representative immunofluorescence histology of representative glomeruli from nephrotic rats 0–10 days after PAN (50 mg/kg) infusion (original magnification, ×60). (B) Proteinuria values (solid line; ANOVA P<0.001) and relative proportion of synaptopodin-positive pixels with colocalized thrombin (dashed line; ANOVA P<0.001) calculated utilizing the colocalization coefficient feature of ZEN software (Zeiss USA). Values are mean±SEM from n=3 rats per time point; 20 random glomeruli per rat. #P<0.05; αP<0.01; ^P<0.001 versus control. Podocyte expression of PAR2 and PAR3, but not PAR1, has previously been demonstrated in human kidney sections by immunofluorescence.34 Immunofluorescence histology demonstrated PAR4 human podocyte colocalization in a cell body predominant pattern, similar to PAR3 (Supplemental Figure 2). Moreover, flow cytometry immunophenotyping revealed that podocytes, freshly isolated from healthy rats, express all four PARs (Figure 3). In vivo rat podocyte expression of PARs. (A) Dot plot showing a single cell suspension of freshly isolated rat kidney glomerular cells stained with a FITC-conjugated antibody to synaptopodin. Gating strategy and the percentage of total cells expressing synaptopodin are shown. (B) Histograms showing the expression of PAR1–PAR4 on synaptopodin-positive podocytes. Unstained podocytes (gray), podocytes stained with APC-conjugated isotype control antibodies (dashed), and podocytes stained with APC-conjugated antibodies to PAR1–PAR4 (solid black) are shown. Each curve represents an analysis of 50,000 events. Data are representative of three separate experiments. APC, allophycocyanin; FSC-A, forward scatter-area; SSC-A, side scatter-area. As previously reported, all four human PARs were detected by RT-PCR (Figure 4A) and Western blot (Figure 4B) in cultured human podocytes.34,35 Thrombin exacerbated PAN-induced podocyte injury with maximal effects at 20 nM (Supplemental Figure 3A). Moreover, 20 nM thrombin was found to induce maximal podocyte injury independently of PAN (Supplemental Figure 3B). To determine which PARs may be involved in thrombin-mediated podocyte injury, a series of PAR antibody blocking and PAR activation peptide (AP) experiments were conducted. Thrombin (20 nM) induced a significant increase in terminal deoxynucleotidyl transferase dUTP nick end labeling (TUNEL)-positive podocytes from 1.4%±0.4% in media-only control to 49.2%±7.3% (P<0.001; Figure 4C). Antibody blockade of either PAR3 (6.46%±3.7%; P<0.001 versus thrombin) or PAR4 (8.9%±3.7%; P<0.001 versus thrombin) resulted in significantly decreased injury. When the thrombin signal was mimicked with APs, PAR4 AP significantly increased the TUNEL signal (40.1%±8.2%; P<0.001 versus control and P<0.001 versus scrambled peptide; Figure 4D), whereas PAR3 AP did not (7.01%±2.94%; P<0.96 versus control; P=0.91 versus scrambled peptide). Further confirming the PAR specificity of 20 nM thrombin signaling in human podocytes, thrombin-dependent extracellular signal–related kinase 1/2 (ERK1/2) phosphorylation was inhibited by PAR3 and PAR4 antibody blockade (P<0.05; Figure 4F). Podocyte viability, by 3-(4,5-dimethylthiazol-2yl)-2,5-diphenyltetrazolium bromide (MTT) assay, was significantly reduced by thrombin (P<0.05), but not rescued by a pan-caspase inhibitor (Z-VAD-FMK; Supplemental Figure 4A). Moreover, podocytes demonstrated F-actin cytoskeletal rearrangement in response to thrombin exposure (P<0.001; Supplemental Figure 4B). Thrombin induces human podocyte injury in a PAR3- and PAR4-dependent manner. (A) PCR and (B) Western blot showing mRNA and protein expression for PARs in cultured human podocytes. (C) PAR-specific antibody blockade of either PAR3 or PAR4 prevents thrombin-induced injury (^P<0.001 versus control; ψP<0.001 versus 20 nM thrombin; 2.5 µg/ml hirudin; n=3 per condition). (D) Stimulation with PAR4-specific AP induces injury to a similar level as thrombin (^P<0.001 versus control; αP<0.01 versus control and scrambled peptide; 20 nM thrombin; 20 µM AP; n=3 per condition); (E) Representative TUNEL images (original magnification, ×20). (F) Thrombin-dependent ERK1/2 phosphorylation was inhibited by PAR3 and PAR4 antibody blockade (upper panel: representative blots; lower panel: densitometric quantification; ωP<0.05 versus thrombin; n=10 per condition). Ab, antibody; AP, activation peptide. Similarly, cultured rat podocytes expressed all four rat PARs by both RT-PCR (Figure 5A) and Western blot (Figure 5B). Because PAR signaling mechanisms are species-specific,34 the same techniques utilized to determine thrombin receptor specificity in the human podocytes were performed. Thrombin (20 nM) significantly increased TUNEL positivity from 1.0%±0% in the control to 33.6%±10.77% (P=0.01; Figure 5C). TUNEL positivity was significantly reduced by preincubation with anti-PAR1 antibody (1.9%±1.37%; P<0.02 versus thrombin) or anti-PAR4 antibody (3.5%±6.1%; P=0.02 versus thrombin). Moreover, stimulation with PAR1 AP induced TUNEL positivity to levels similar to thrombin exposure (37.5%±8.27%; P<0.001 versus control and P<0.05 versus scrambled peptide; Figure 5D), whereas PAR4 AP did not (19.01%±6.35%; P=0.16 versus control; P=0.94 versus scrambled peptide). Thrombin-dependent ERK1/2 phosphorylation was inhibited by preincubation with PAR1 and PAR4 antibodies (P<0.05; Figure 5F). 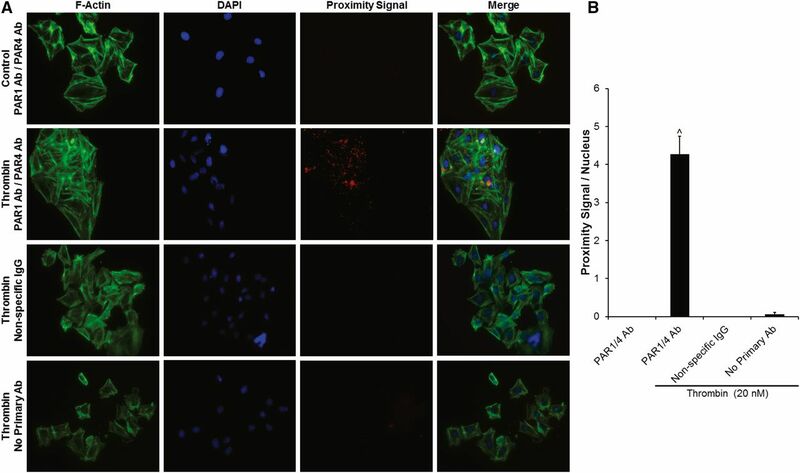 Podocyte viability and F-actin rearrangement studies were congruent with those observed in human podocytes (P<0.05 and P<0.001, respectively; Supplemental Figure 5). Thrombin induces rat podocyte injury in a PAR1- and PAR4-dependent manner. (A) PCR and (B) Western blot demonstrating PAR expression in cultured rat podocytes. (C) PAR-specific antibody blockade of either PAR1 or PAR4 prevents thrombin-induced injury (#P<0.05 versus control; ωP<0.05 versus 20 nM thrombin; 2.5 µg/ml hirudin; n=3 per condition). (D) Stimulation with PAR1-specific AP induces injury to a similar level as thrombin (^P<0.001 versus control; *P<0.05 versus scrambled peptide; 20 nM thrombin; 20 µM AP; n=3 per condition). (E) Representative TUNEL images (original magnification, ×20). (F) Thrombin-dependent ERK1/2 phosphorylation was inhibited by PAR1 and PAR4 antibody blockade (upper panel: representative blots; lower panel: densitometric quantification; ωP<0.05 versus thrombin; n=6 per condition). Ab, antibody; AP, activation peptide. To assess for thrombin-dependent PAR3/PAR4 interactions in human podocytes and PAR1/PAR4 interactions in rat podocytes, we conducted proximity ligation assays (PLAs) in the presence and absence of thrombin. Because PARs are known to be rapidly endocytosed and degraded after cleavage-dependent activation, we first performed a time-dependent thrombin exposure experiment with human podocytes to determine the optimal exposure time for subsequent experiments (5 minutes; Supplemental Figure 6).39 We then performed PLA experiments demonstrating the presence of PAR3/PAR4 interactions in human podocytes only in the presence of thrombin (4.15±1.42 PLA signals/nucleus versus 0±0 PLA signals/nucleus in control; P<0.01; Figure 6, A and B). Similarly, PAR1/PAR4 interactions were only observed after 5 minutes of thrombin exposure in rat podocytes (4.27±0.46 PLA signals/nucleus versus 0±0 PLA signals/nucleus; P<0.001; Figure 7, A and B). Importantly, no significant PLA signal was detected with isotype-matched, nonspecific control antibodies in either species of podocyte (Figures 6 and 7). Coimmunoprecipitation (co-IP) assays were utilized to confirm these PLA findings and to screen for other PAR-PAR interactions not predicted by the antibody blockade and AP stimulation experiments (Figure 8). Thus, in human podocytes, thrombin (20 nM) significantly increased PAR3-PAR4 co-IP (P<0.05; Figure 8, A–C), and PAR1-PAR4 interactions were enhanced in rat podocytes (P<0.05; Figure 8, D–F). Co-IP was negligible for other combinations tested in both species. Thrombin induces PAR3/PAR4 interactions in human podocytes. (A) Representative PLA images demonstrating the presence of PAR3/PAR4 interactions in human podocytes only in the presence of thrombin (original magnification, ×20). (B) Proximity signals per nucleus (αP<0.01 versus control; n=4 per condition). Thrombin induces PAR1/PAR4 interactions in rat podocytes. (A) Representative PLA images demonstrating the presence of PAR1/PAR4 interactions in rat podocytes only in the presence of thrombin (original magnification, ×20). (B) Proximity signals per nucleus (^P<0.001 versus control; n=4 per condition). PAR-PAR interactions in human and rat podocytes confirmed by co-IP. (A–C) Human podocyte PAR co-IP experiments: (A) Representative blots after 5 minutes of exposure to 20 nM thrombin. (B) Relative PAR3 protein after PAR4 immunoprecipitation. (C) Relative PAR4 protein after PAR3 immunoprecipitation. 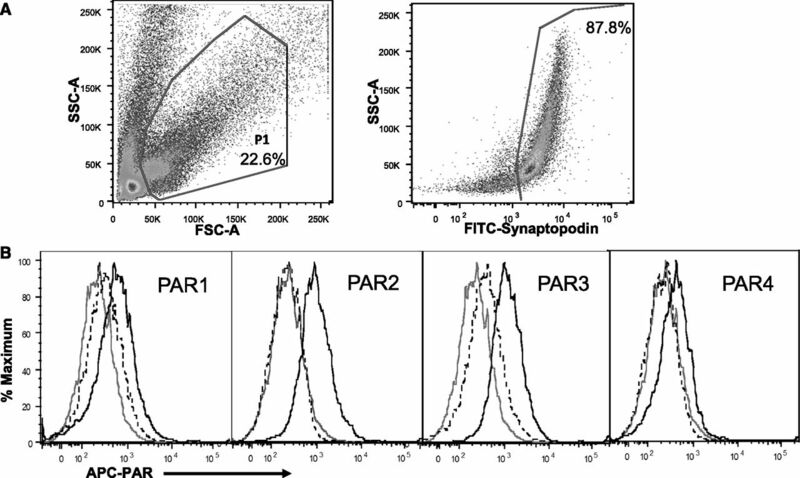 (D–F) Rat podocyte PAR co-IP experiments: (D) representative blots after 5 minutes of exposure to 20 nM thrombin; (E) relative PAR1 protein after PAR4 immunoprecipitation; (F) relative PAR4 protein after PAR1 immunoprecipitation. #P<0.05, n=3–6 per condition. Con, Control; Thr, Thrombin. In this study, highly-specific thrombin inhibition partially ameliorated proteinuria in experimental PAN-induced NS to a similar degree as nonspecific thrombin inhibition. A similar benefit was observed in the podocyte-specific hDTR NS model. We demonstrated that thrombin interacts in vivo with podocytes during PAN NS. We established that podocytes express the PAR family of coagulation receptors in vivo and that thrombin induces in vitro podocyte injury in a PAR-dependent manner. 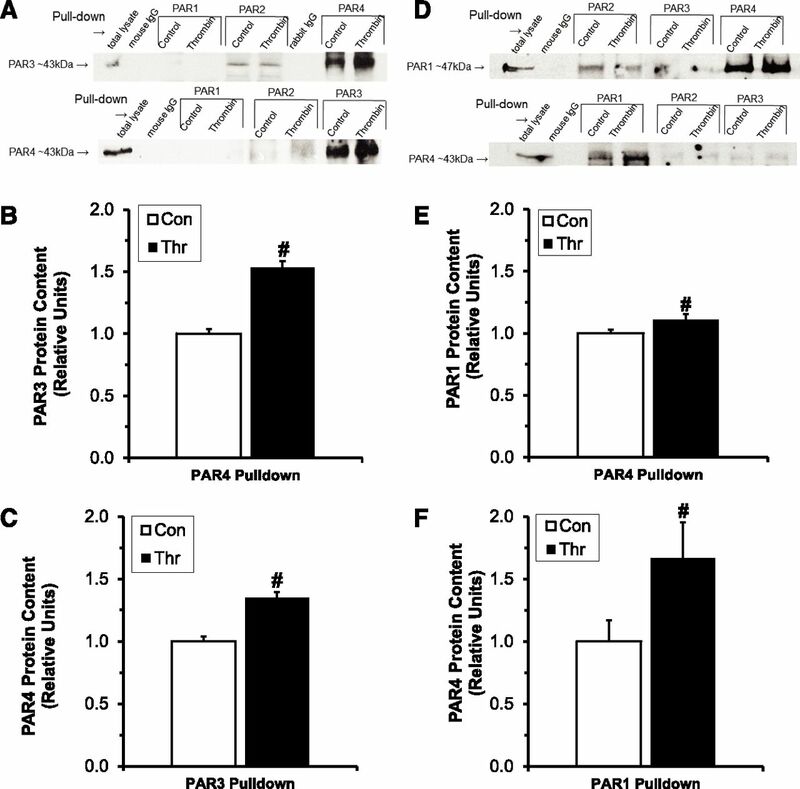 PAR3/PAR4 interactions have not been previously observed in human cell biology, but were observed in podocytes after thrombin exposure in this study.36 In rat podocytes, thrombin-mediated podocyte injury occurs via PAR1 in a PAR4-dependent manner and thrombin induced PAR1/PAR4 interactions. Thus, interrupting thrombin signaling may offer a novel approach to reduce podocyte injury during NS. In vitro, both human and rat differentiated podocytes expressed all four members of the PAR family, at both the mRNA and protein level.34,35 Interestingly 20 nM thrombin, previously demonstrated to exacerbate glucose-induced podocyte injury, injured podocytes independently of both glucose and PAN.20 In addition to providing important confirmation of our previous observation, these data provide further evidence that high-concentration thrombin directly injures podocytes. Importantly, on the basis of peak thrombin generation in PAN-nephrotic plasma (approximately 300 nM),12 20 nM concentrations are speculated to be possible within Bowman’s space during NS. However, the precise concentrations of thrombin achieved within the ultrafiltrate or on the podocyte surface have not been established. Nonetheless, 20 nM is approximately three orders of magnitude below the published Michaelis constant for thrombin cleavage of PAR1 and PAR4 (26–28 µM and 56–61 µM, respectively),44–46 suggesting that subtle changes in local thrombin activity may be biologically relevant to podocytes. In pilot experiments, we exposed cultured podocytes to a range of thrombin concentrations around 20 nM, with maximal injury observed at 20 nM. Thrombin-induced podocyte injury appears to be mediated by PAR1 in a PAR4-dependent manner in rat podocytes, whereas it is mediated by PAR4 in a PAR3-dependent manner in human podocytes. 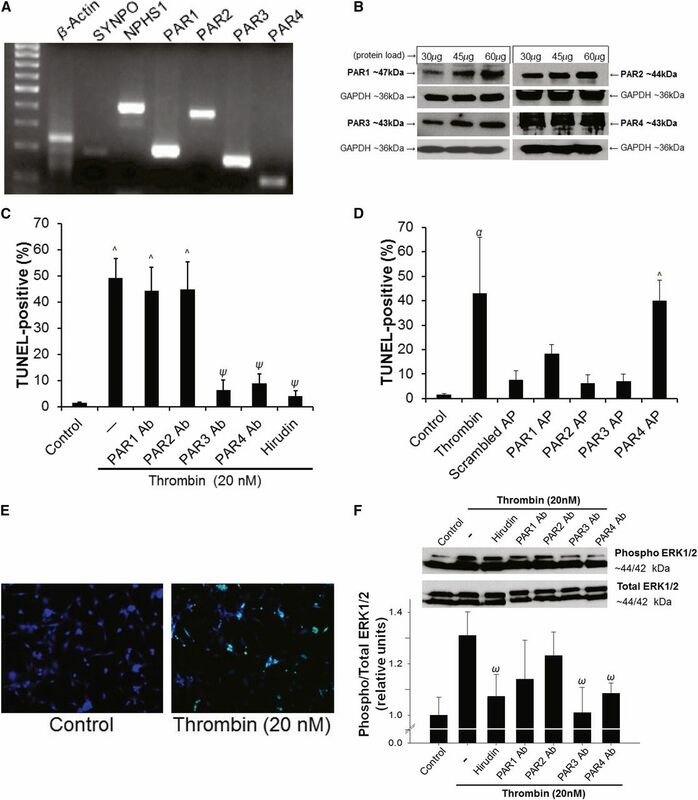 The ERK1/2 phosphorylation data suggest that thrombin-dependent podocyte injury may be mediated via the MAPK signaling pathway, which has been implicated in other cell types after thrombin exposure.47,48 Importantly, podocyte viability is reduced upon thrombin exposure, an effect not reversed by caspase inhibition, suggesting that thrombin-induced podocyte injury is caspase independent. The applicability of these PAR data to in vivo nephrosis awaits additional studies with appropriate PAR-specific inhibitor treatments. PAR-PAR interactions have previously been published for most PAR combinations, including both homodimer and heterodimer interactions.36 These interactions may be cofactor phenomena, wherein a protease binding to the first PAR facilitates cleavage of a neighboring PAR.36 This mechanism was originally described for PAR3-dependent activation of PAR4 in thrombin-dependent mouse platelet activation.49,50 Alternatively, transactivation involves activation of a PAR by the tethered ligand of a nearby PAR, as has been described for PAR1 transactivation of PAR2.36,51 Additionally, substantial evidence suggests that the PARs may homo- or heterodimerize after activation-dependent allosteric changes in PAR conformation.39,52–54 This mechanism, which may alter the downstream G-protein and/or β-arrestin pathways involved in intracellular signaling, has been recently demonstrated for PAR1/PAR4 heterodimer-dependent thrombin-mediated activation in human platelets.52 However, interactions between human PAR3/PAR4 have not, to our knowledge, been described previously.36 In this study, proximity ligation was chosen to confirm PAR-PAR interactions because this technique allows for light microscopy detection of molecular interactions without genetic manipulation of the cultured cells, such as may be required for other techniques.36 This technique has recently been utilized to detect protein-protein interactions involved in both integrin signaling and non-PAR GPCR interactions.55–57 Proximity ligation detects target epitopes that are ≤400 Å apart.55–58 The crystal structure of PAR1 reveals that its dimensions are approximately 88.9×88.9×88.7 Å.59 Although the crystal structure of the other PARs have not been published, it is reasonable to speculate, on the basis of similarities in sequence and molecular mass that the dimensions of the remaining PARs are similar. Therefore, it is possible that the PLA signals observed in these studies represent close proximity (≤400 Å), but not direct molecular interactions. However, these interactions were confirmed by co-IP assays and are consistent with our functional assay data (PAR antibody blockade and AP stimulation), strongly supporting the notion that these PARs interact with one another in a biologically meaningful way. Importantly, PAR dimers are known to be dependent on interactions between hydrophobic transmembrane domains,60,61 thus the co-IP experiments included bis(sulfosuccinimidyl)suberate, an 11.4-Å-long crosslinking reagent,62 to stabilize PAR dimers during aqueous phases of the protocol, suggesting that the PARs are in direct contact with one another. This hypothesis is further supported by studies demonstrating that PAR-PAR heterodimers are involved in activated protein C signaling events in both mouse and human podocytes.20,33,34 Nonetheless, confirmation of these interactions await molecular biology studies designed to define which PAR domains are involved in the formation of these complexes. Previous investigations have demonstrated that anticoagulants improve proteinuria in animal models of NS.15–18 Conversely, thrombin may exacerbate podocyte injury.20 However, these studies stopped short of determining (1) the thrombin specificity of anticoagulant effects on proteinuria and (2) the molecular receptors involved in thrombin-mediated podocyte injury. 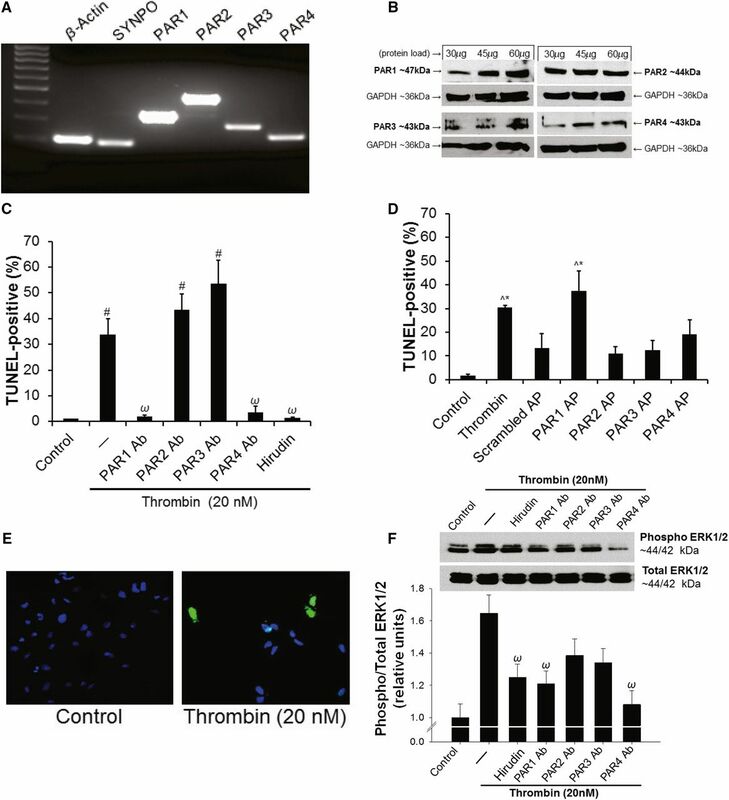 Thus, in this study, we have demonstrated that (1) highly-specific thrombin inhibition reduces proteinuria in experimental rat nephrosis; (2) thrombin-induced podocyte injury is mediated by PARs in a species-specific manner, consistent with species-specific PAR signaling in other cell types54; and (3) that these receptors are expressed by podocytes in vivo. Further, our data suggest that this injury may be dependent on specific PAR-PAR interactions. Taken together, these data, along with the previously published observations, suggest that ultrafiltered prothrombin during nephrotic-range proteinuria may be a key driver of ongoing and potentially progressive podocyte injury. Thus, strategies to interrupt this pathway may lead to novel therapeutic approaches benefitting patients who are resistant to conventional therapy, or as an adjuvant therapy to accelerate remission and slow progression toward ESRD.8 PAR3 is not involved in human platelet biology but is involved in the activated protein C podocytoprotective phenomenon.34,36 Thus, an intriguing approach may be to disrupt PAR3/PAR4 interactions if they prove to be necessary to in vivo thrombin-mediated podocyte injury. Such an approach could avoid the bleeding risks associated with currently available anticoagulants and also leave activated protein C–mediated PAR2/PAR3 heterodimer-dependent cytoprotection intact. For full details on materials and methods, please see Supplemental Material. All procedures were approved by The Research Institute at Nationwide Children’s Hospital Institutional Animal Care and Use Committee and performed in accordance with the National Institutes of Health Guide for the Care and Use of Laboratory Animals. For the AT and hirudin experiments, AT (500 IU/kg daily via tail vein) or hirudin (1 mg/kg subcutaneous twice daily) was administered beginning immediately after PAN injection (Wistar rats).18,63 Control animals received vehicle injections by the respective route/frequency and all animals were euthanized on day 10. The hDTR transgenic rat model was kindly provided by Dr. Roger C. Wiggins (University of Michigan, Ann Arbor). The hDTR rats received a single dose of intraperitoneal diphtheria toxin (DT; 25 ng/kg) on day 0, after which subcutaneous hirudin or vehicle was administered per the above dose and frequency.38 Urine was collected for proteinuria analysis on days 0 (before PAN or DT injection) and 10. In experiments to evaluate urinary markers of thrombin activity, varying doses of PAN (0–150 mg/kg) were utilized to induce dose-dependent proteinuria, as previously described.12 After urine collection on day 9, the rats were anesthetized with 3% isoflurane and blood was collected from the inferior vena cava using a 23-G needle into 0.32% sodium citrate/1.45 µM corn trypsin inhibitor, final concentrations (Haematologic Technologies Inc., Essex Junction, VT).12,64 For the immunofluorescence colocalization experiments, Wistar rats received a single dose of intravenous PAN (50 mg/kg) on day 0 to induce nephrosis, as previously described.12,18,65,66 After urine was collected at the time points indicated in Figure 2, the animals were euthanized using the above protocol and kidneys collected for immunofluorescence histology. Kidneys were harvested from healthy Wistar rats for the flow cytometry immunophenotyping experiments. Paraffin-embedded rat kidney sections were deparaffinized and antigen retrieval was performed at 100°C. Super Block (Scytek Laboratories, Inc., West Logan, UT) was applied for two consecutive 30-minute intervals at 37°C (250 µl/slide) to reduce nonspecific staining. Primary antibodies for SYNPO (1:5 dilution) and thrombin (1:100 dilution) were incubated for 48 hours at 4°C in Super Block. Slides were washed for 10 minutes at room temperature with 0.5% Tween-PBS three times. Secondary antibodies (Alexa Fluor 594 anti-rabbit IgG and Alexa Fluor 488 anti-mouse IgG; 2 µg/ml each) were applied overnight at 4°C. Sections were mounted with ProLong Gold Antifade Mountant with 4',6-diamidino-2-phenylindole (DAPI) stain (Thermo Fisher Scientific, Grand Island, NY). Images were captured with a BZ900 microscope (Keyence, Osaka, Japan) and analyzed with ZEN software (Zeiss USA, Thornwood, NY). Colocalization analysis was performed on a pixel-by-pixel basis, wherein every pixel within the defined region of interest (glomerulus, see red demarcation line in “false color” images of Figure 2A) is plotted in a scattergram on the basis of fluorescence intensity of each channel. The software calculates the colocalization coefficient as the proportion of colocalized pixels (positive in both channels) within the total population of a single channel, green (SYNPO-positive) for the purposes of this study.67 For normal human kidney PAR4 expression, immunofluorescence staining was performed on previously reported paraffin-embedded sections.34 Briefly, after rehydration, sections were boiled for 30 minutes in water for antigen retrieval, blocked in 10% horse serum for 1 hour, incubated with primary antibodies (1:50 or blocking solution only for negative controls) in a humidified chamber for 3 days at 4°C, and washed in PBS. Secondary antibodies (1:200) were added in humidified chambers overnight at 4°C, washed in PBS, and mounted under coverslips. Images were obtained with a Leica SP5 confocal microscope. Glomeruli were isolated using sequential sieving, as described previously.66,68,69 Glomerular cells were dissociated as previously described, with minor modifications.70 Briefly, glomeruli were suspended in 2 ml digestion buffer (300 U/ml type 4 collagenase and 50 U/ml DNase I [both from Worthington Biochemicals, Lakewood, NJ] with 2.8 U/ml Dispase II [Sigma-Aldrich, St. Louis, MO] in HBSS [Gibco; ThermoFisher, Grand Island, NY]) and incubated at 37°C on a thermomixer shaking at 1150 rpm for 32 minutes, intermittently shearing the cell suspension with a pipet tip. Tissue debris was removed by filtration (40 µm pores) and washed with HBSS. Cells were concentrated by centrifugation (1500 rpm for 5 minutes at 4°C), resuspended in 2 ml HBSS with 0.1% BSA and DAPI (1 µg/ml), and cell concentration measured. Aliquots of approximately 3×106 cells/ml were washed with BD BSA stain buffer (Fisher Scientific, Pittsburgh, PA), blocked with mouse anti-rat CD32 (10 µg/ml; BD Biosciences, San Jose, CA), and stained with FITC-labeled anti-rat synaptopodin antibody (1:5) and allophycocyanin-labeled anti-rat PAR antibodies (PAR1 and PAR2 at 4.4 µg/ml, PAR3 and PAR4 at 3 µg/ml). Fluorescence-labeled, isotype-matched, nonspecific antibodies were used for controls. Cells were analyzed on a LSR II flow cytometer (BD Biosciences) and PAR expression was analyzed only on cells within the synaptopodin-positive gate. Isotype controls, unstained cells, and an open channel were used to identify and calibrate for autofluoresence. Each curve in Figure 3 represents an analysis of 50,000 events. Results were confirmed using three rats in three separate experiments. PLA experiments were performed on human podocytes (grown in an eight-well chamber slide system) and rat podocytes (grown in six-well plates with coverslips) and analyzed using the DUOLink kit (Sigma-Aldrich) according to the manufacturer’s instructions and as described previously.71,72 After blocking, anti-PAR antibodies were applied at 10 µg/ml; nonspecific rabbit IgG (Santa Cruz Biotechnology, Dallas, TX) and mouse IgG2b (Bio-Rad, Hercules, CA) were used as controls. Oligonucleotide-conjugated secondary antibodies against mouse and rabbit primary antibodies were utilized to detect protein-protein associations, visualized as bright red dots by microscopy. Each slide was mounted with PLA mounting reagent containing DAPI and counterstained for actin using Alexa Fluor 488 phalloidin staining solution, which was added at 2 U/coverslip for 20 minutes before mounting the slides. The PLA signal was quantified with a BZ900 microscope and software (Keyence) by manually counting the number of red dots per nucleus in at least five random fields per condition. Statistical significance was determined by the unpaired paired t test for single comparisons and one- or two- way ANOVA for multiple group comparisons, using SigmaStat software (Systat, San Jose, CA). Statistical significance was defined as P<0.05. Data are presented as mean±SEM. The authors thank Dr. Charles J. Lockwood and Dr. Matthias Kretzler for meaningful critique of experimental designs, Melinda A. Chanley, Adam Guess, Xiaojing Nie, Victoria Best, and Cynthia McAllister for contributing to the refinement of analytic techniques, and Dr. Roger C. Wiggins for providing the human diphtheria toxin receptor rat model. R.S., A.P.W., S.A., K.J.W., H.L., and K.S. conducted the experiments, analyzed the data, prepared the figures, and wrote the manuscript. M.T.N. prepared and provided critical reagents and wrote the paper. W.E.S. provided cell cultures and animal models and edited the paper. B.I. advised on study design and reagent choices and wrote the paper. B.A.K. conducted the experiments, analyzed the data, wrote the manuscript, and was responsible for overseeing and coordinating the study. This work was supported by National Institutes of Health, National Institute of Diabetes and Digestive and Kidney Diseases grants L40DK103299, U54DK083912-05S1, U54DK083912-07S1, and K08DK103982 (to B.A.K. ), and R01DK095959 (to W.E.S. ); National Heart, Lung, and Blood Institute grant R01HL098217 (to M.T.N. ); Deutsche Forschungsgemeinschaft DFG IS67/5-3 and DFG IS67/8-1 (to B.I. ); the CSL Behring Foundation Professor Heimburger Award (to B.A.K. ); the George and Elizabeth Kelly Foundation (Lewis Center, OH; to B.A.K. ); the Nationwide Children’s Hospital Foundation Hitchcock-Wilson Fellowship in Pediatric Hematology, Oncology, and BMT (to R.S. ); and the Nationwide Children’s Hospital Foundation Joan Fellowship in Pediatric Hemostasis-Thrombosis (to R.S.). Portions of this work were previously presented at meetings of the American Society of Hematology, Orlando, FL December 5–8, 2015, American Society of Nephrology, San Diego, CA, November 3–8, 2015, and International Society on Thrombosis and Haemostasis, Milwaukee, WI, June 23–26, 2014. R.S. and A.P.W. contributed equally to this work. This article contains supplemental material online at http://jasn.asnjournals.org/lookup/suppl/doi:10.1681/ASN.2016070789/-/DCSupplemental.